A shattering story of memory, loss, and just how far a man will go to keep his family intact. “Sure to appeal to fans of emotionally involving fiction.” —Kirkus Reviews “Urgent, real, and often very funny.” —James Frey, New York Times bestselling author of Bright Shiny Morning and A Million Little Pieces “Impossible to put down, it’s a book I know I’ll read again and again; it made me laugh, cry and want to be a better writer. It should be at the top of your to-read list.” — Catherine McKenzie, bestselling author of Hidden In the Michigan resort town of Port Manitou, dedicated teacher and running coach Neil Kazenzakis shoulders responsibilities that would break a lesser man: a tragic accident has left his wife seriously debilitated, he cares for his mother-in-law, who suffers from dementia, and he’s raising his teenage son, Chris, on his own. On top of all that, he’s also secretly been seeing Lauren, his mother-in-law’s caregiver. When Neil breaks up a fight one day after school, he doesn’t give the altercation much thought. He’s got bigger issues on his mind, like the fact that Lauren is ready for a commitment and he has to figure out a way to tell Chris that he’s in a serious relationship with someone other than the boy’s mother. But when an anonymous person uploads a video of the fight to YouTube, the stunning footage suggests Neil assaulted a student. With his job, his family, and his reputation suddenly in jeopardy, Neil must prove his innocence and win back the trust of the entire community—including his son’s. 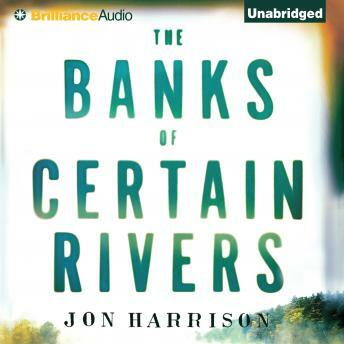 Jon Harrison’s The Banks of Certain Rivers is a powerful tale of family, loss, and the meaning of love.